Yes, it’s officially my last week in Amsterdam. I finished my last UvA exam today, which also concluded my last visit to Science Park. I thought my trips there would never end, but suddenly my time is over! I am currently sitting in City Hall, attempting to get proof of my deregistration from Amsterdam. So many technical things to account for this week. I’m getting there. Despite stressing over my über huge to-do list, I managed to have fun this weekend with my wonderful friend from college, Yael! We hadn’t seen each other in a full year, but like all visitors, I realize that absolutely nothing changes with friends. 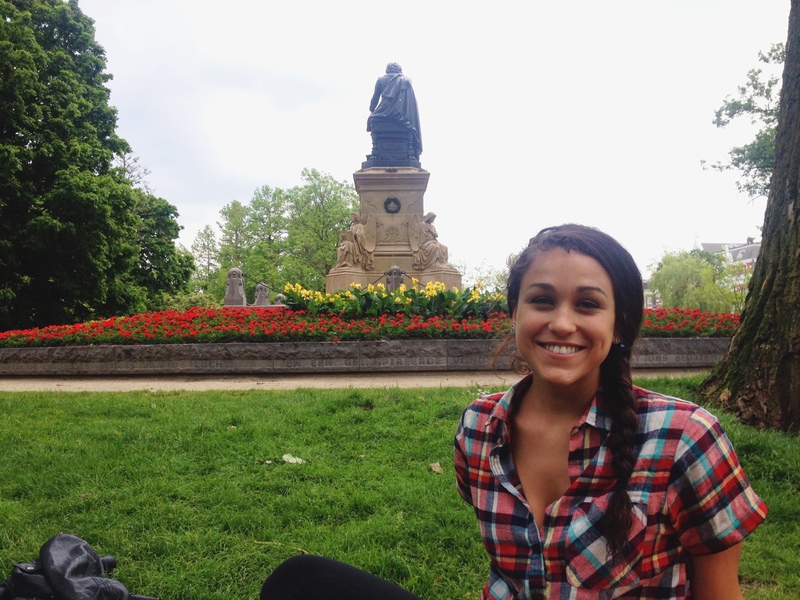 I had this same experience with my friend Lily from Hockaday who visited 2 weekends ago. It had been easily 3 years since I’d seen her, but it felt so normal. With both of these visitors, I got to relax and see more of my city while simultaneously still trying a few new things. Yael’s visit was a combination of goodbyes and new experiences. I loved them equally. 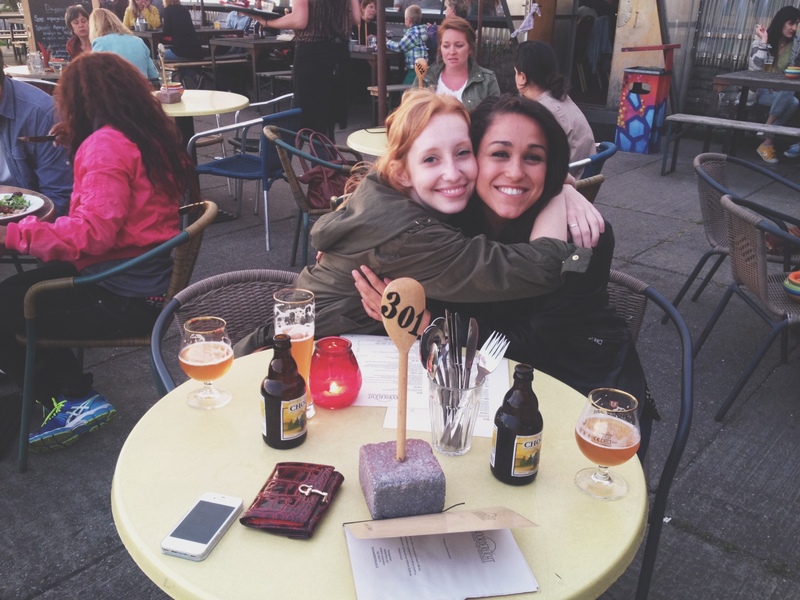 We explored Noord Amsterdam her first night here. It was a little mix of an early birthday celebration for Natalie, finally going to Noorderlicht Cafe, and showing Yael a great part of Amsterdam. 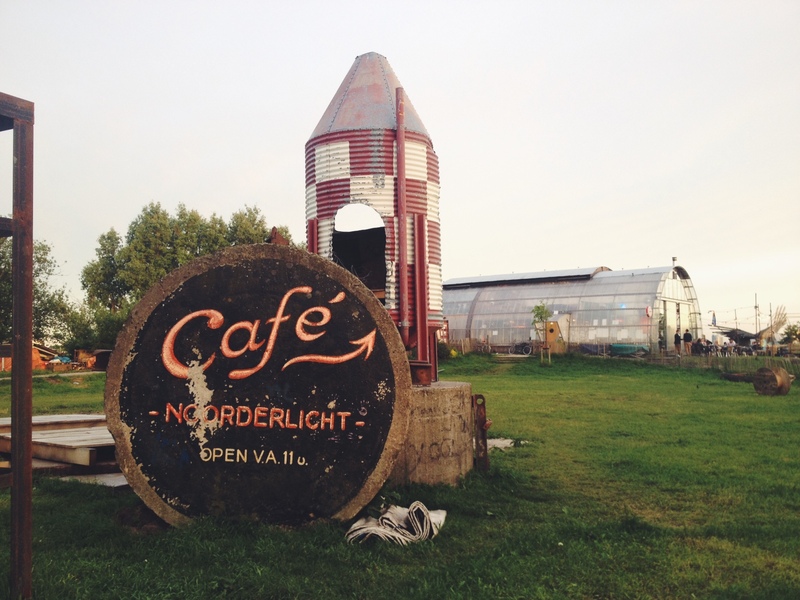 We went to Noorderlicht as well as Pllek, both are beach-y cafes with lots of outdoor seating. And let me tell you, a picnic table outside, friends, and a beer are truly all you in Amsterdam Noord. We watched the sunset and the beautiful Amsterdam clouds while the three of us bonded. I love having friends from different points in my life meet. Nat and I had also talked about “tagging” Amsterdam with the spray paint left over from when she painted her bike. Amsterdam Noord is an industrial area covered in graffiti, so it was the right place. 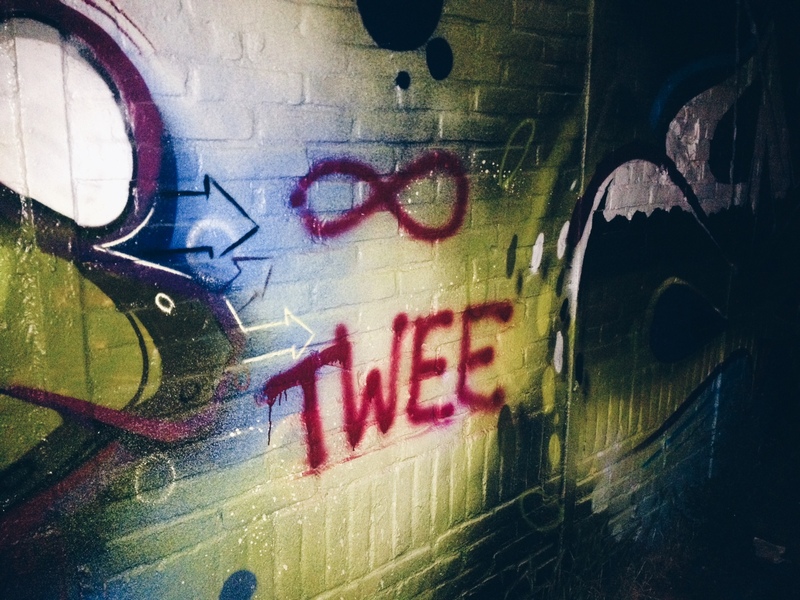 We found an open spot and sprayed “Twee” (two in Dutch), and an infinity sign. Cliche, whatever, but it represents the two great explorers, forever. Noorderlicht. The sunset hadn’t started yet! Our poor attempt at art… that’s ok! Yael did exploring on her own during the day on Friday while I studied. 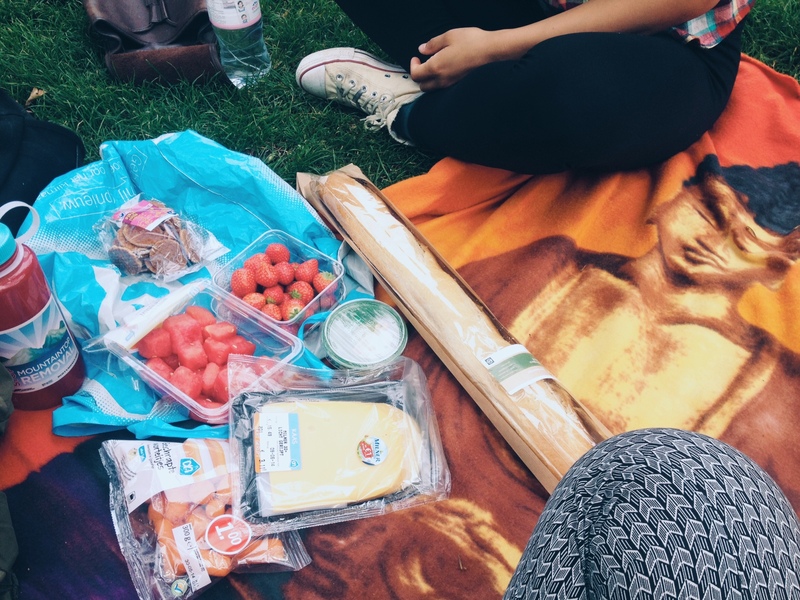 We still met up for a picnic in Vondelpark and then went out to drinks with friends on Friday night. First we went to Thijssen in Jordaan and then went to Leidseplein to find my friend from Pitzer that lives in the Netherlands, Harry, and 4 boys from Pitzer that were staying with him for the weekend. They were doing a pub crawl, but we opted out and just joined in later. We never spend time in Leidseplein unless it’s for a special occasion, super touristy, but it was good to get out of my Jordaan comfort-zone for a bit and say goodbye to the busiest clubbing square. Vondelpark picnic… tired of picnic picture yet? Nat and me at Thijseen in Jordaan. 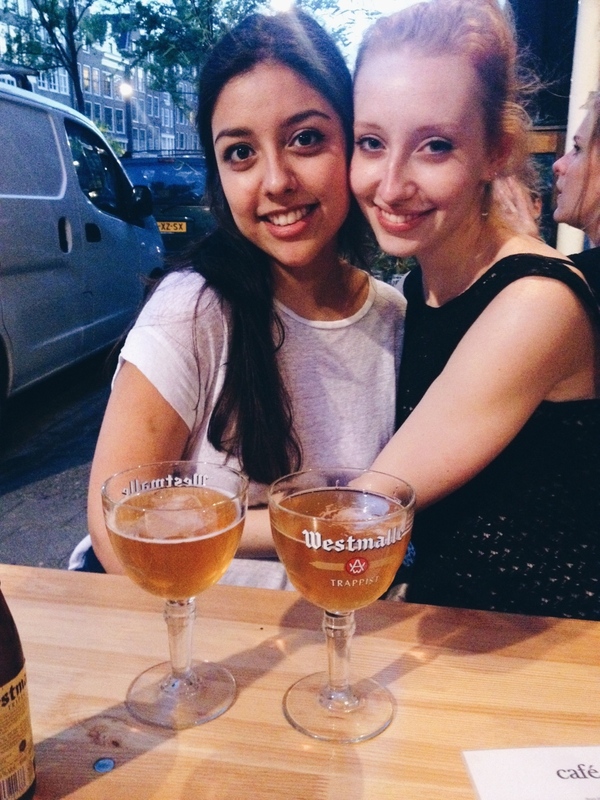 On Saturday, Yael and I went to Espressofabriek for my final goodbye. We enjoyed flat whites and talked about how we’ll both be coming back to Europe to raise our kids (most likely Scandinavia). This was as we looked around and saw a ton of adorable children with no other than their fathers enjoying a morning in Westergasfabriek. Afterwards we perused Noordermarkt for my last time and then stopped for a raw herring sandwich. It had been nine months and still no herring! If I wouldn’t have tried it, I would have failed at being Dutch. 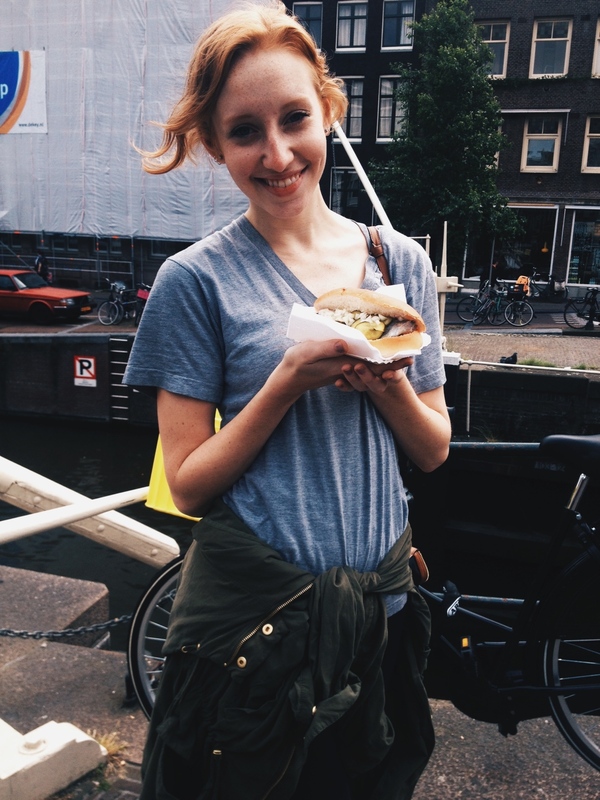 We stopped at a small place on Haarlemmerstraat to get my fish fix and I actually really enjoyed it. Yael documented the experience for me, while also adding that she learned how herrings communicate in the water through farts. Thanks for that, Yael. We did more exploring through the city on Saturday before grabbing dinner with our Pitzer friends. The rest of her time here was spent catching up, eating pancakes, and seeing how words and phrases in German and Dutch compare. Spoiler alert, they are really similar. Smiling with some herring, pre-bite. It is served in a bun with pickles and onions. Trying to eat while Yael explained the farting fish phenomenon. This is officially the second to last blog post and that’s a terrifying thing. 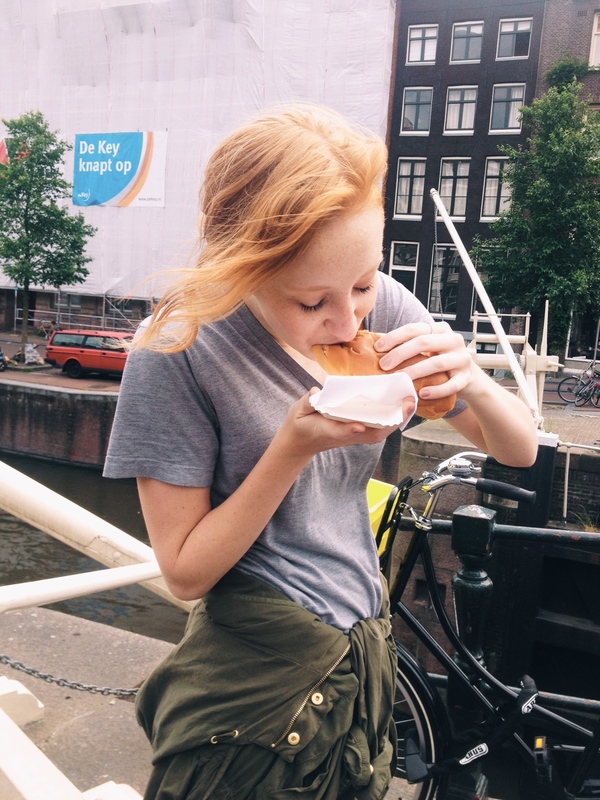 Maybe this could turn into a more regular Lily travel blog, but maybe I should just leave it as my Amsterdam adventures. Who knows where I’ll end up next! For now, I will continue to wrap up things here and enjoyed my last few nights with a few dinners and drinks with friends. I can’t let my leaving be too dramatic, I’ve never been that type of person. It’s a see you later Amsterdam, definitely not a goodbye. But all those insights will come in my final post, most likely written in the air on my way back to America! Tot ziens! Young profesh living and learning in Austin TX. Still drinking coffee.